Well, I succumbed – to Rogue. But then, you knew that, didn’t you? It didn’t take a psychic to predict that I would. It all started innocently enough (as these things usually do). 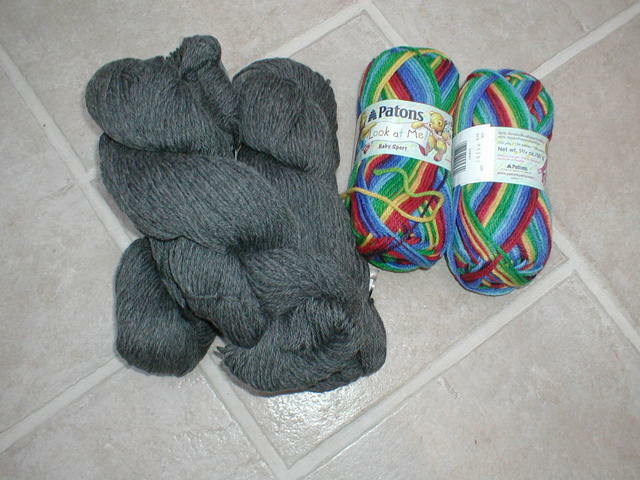 I bought the yarn for Rogue with the gift certificate my parents gave me for Christmas (Thanks, Mom & Dad!). Of course, once I got it home I just had to wind at least a few skeins into balls. And what harm could there be in doing a gauge swatch? This was actually quite an advancement for me. 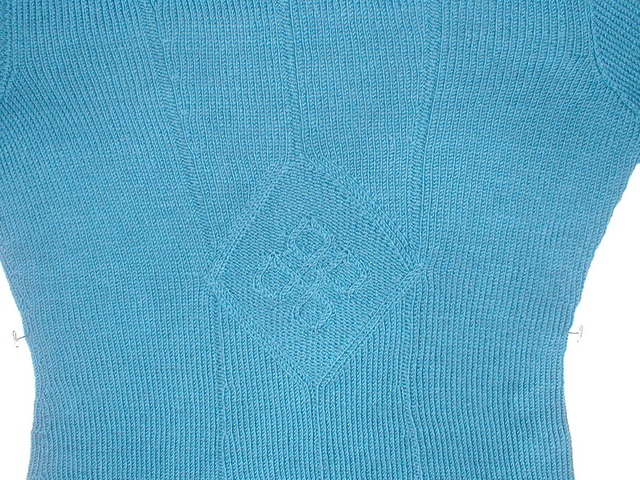 My history with fit on my sweaters has been hit or miss, mainly due to the fact that I hate to do swatches. I always figure it will fit someone! 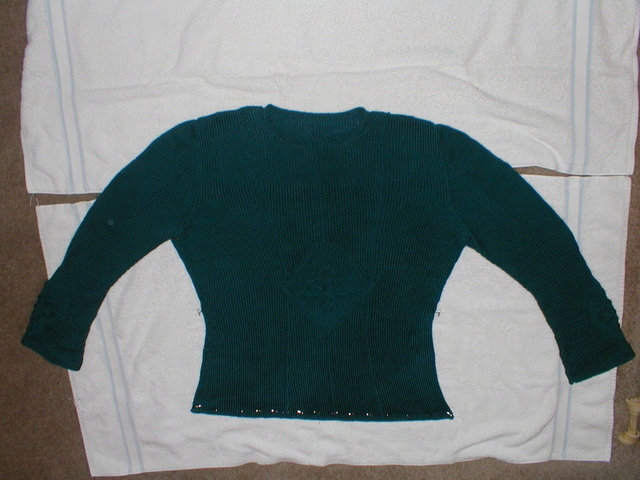 But this time I really wanted it to fit me, so I not only did a swatch, I washed and blocked it. See? 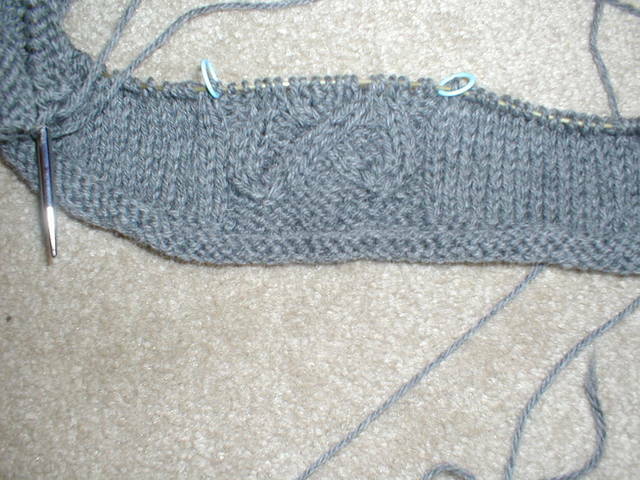 I have reached the point at which the pocket begins and will lay it aside for a few days (yeah, right) because I promised a friend I would test knit a baby pattern for her. 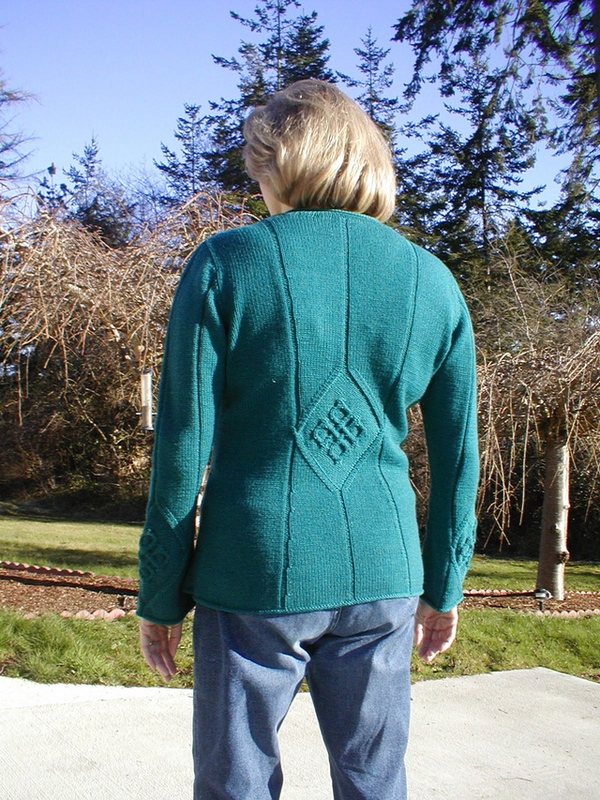 But it’s on Encore, size 8 needles and should go quickly. And, I can begin Rogue without guilt because in the last 6 months I have finished: a baby afghan, two baby sweater/hat sets, two pairs of socks, the Viking Turid for me and the Aranmor for my husband (both started at least two years ago) and (drum roll, please) THE MEDITERRANEAN SHAWL! Yes, indeedy – I finished it! I underestimated how quickly the border would go, and along with my obsession with it, voila! Fini! Pictures will follow as soon as I can set aside time to block it. That may take almost as long as the knitting. On the school front I am making great progress on my Sociology class. I received my grade from the midterm – 92!! And this morning I submitted my fourth written assignment. In it I answered the following questions: If a lie detector could be made 100% accurate, where and when should it be used? (Nowhere! Freedom of thought is our most precious liberty and thought without action does not constitute a crime). Do immigrants benefit the U.S.? (Legal, yes, illegal, no, although in all honesty we must admit that cheap illegal migrant workers allow us cheap, abundant produce. Culturally, immigrants provide our otherwise ethnocentric society with valuable cultural diversity). Does free trade help or harm the environment? (Harms, because it allows large multinational corporations, who are not known for their social consciences, to export harmful environmental practices to poorer nations who are willing to trade their environment for economic advantages. We should be just as mindful of the environment of poorer countries – and their workers – as we should of our own.) So there you have my opinions in a nutshell. All I had to do was expand those thoughts into 9 pages, along with references and citations. Piece o’ cake. Rattling on has always been one of my long suits! ob-ses′sion n. 1. Being haunted by or troubled in mind. 2. Preoccupied. Well, that about sums up my attitude with the Mediterranean Shawl. I seem to be obsessed with it this week. Part of it, I know is because I can see the end coming. 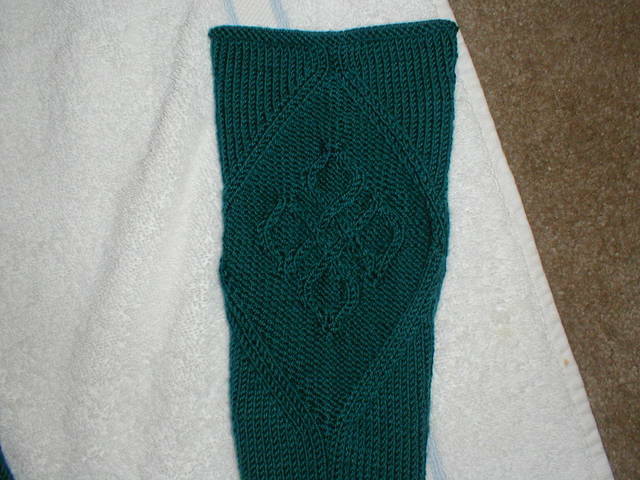 Progress has been much speedier than I expected, and if all goes well, it may be finished (at least the knitting) by the end of this week or next. The blocking is another matter – I may need to set aside an entire morning. That puppy is HUGE! The other reason I think I have been obsessed is as an escape. This has been a very stressful week and working on the shawl, with its repetition and precision has given me at least a semblance of control in one area of my life. Thanks to everyone who sent condolences on the loss of my husband’s father. I’m sure that all of you can identify with the fact that any large gathering of family (and my husband’s family is large), with its disparate personalities (I’m being kind here) can be quite stressful and unpredictable. I’m happy to report that everyone, with the exception one in-law, was quite well behaved. It was great to catch up with everyone and some of the kids were too cute to be believed. (At one point my great-nephew, 4 years old and dressed up as Batman, came running into the room and yelled, “I need a skinny girl!” You can imagine the hoots of laughter from a bunch of waistline-impaired middle-aged women! We never did figure out exactly what he needed a skinny girl for.) My husband’s brother did an excellent job of eulogizing a father who caused a great deal of pain to his children. Without glossing over his faults or vilifying him, he thanked him for all the things he did give his children, and pointed out that his father was in need of forgiveness from God, as we all are, because we are all sinners. There was a wonderful turn-out and I was so pleased to see several people from my church and my work who did not know my father-in-law, but were there to support me and my husband. I am glad, however, that the week is over. I’ve determined that I need a certain amount of quiet and solitude in my life and that has not been in great abundance this week. 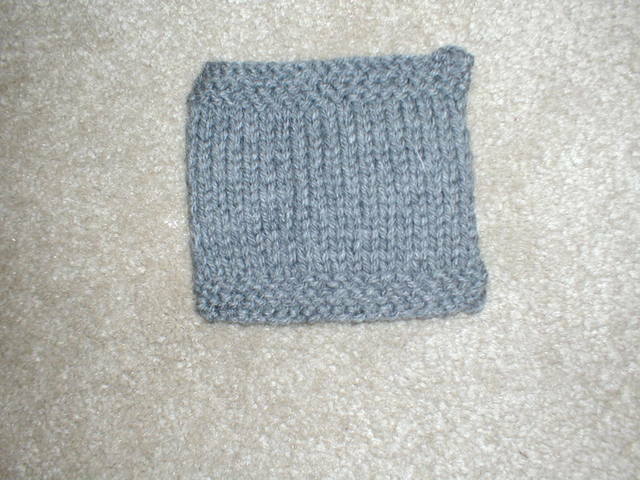 The heather grey is Cascade 220 and will eventually be a Rogue. The multicolor sport will be a Baby Surpise Jacket for the grandchild. After watching Eilene’s blog, I am so eager to start Rogue, but am trying to restrain myself. I need to finish “The Shawl” and I am so behind in my school work. I know that if I start Rogue I will not want to do anything else. I also need to finish the baby quilt I have started – I don’t want to be under pressure at the last minute. But I was a good girl and studied for over 2 hours today, so I’m going to reward myself with a movie and knitting. Have a great week all! It’s been a sad day at the Waite household. My husband’s father passed away yesterday after a long battle with Alzheimer’s. What amazed us all was how shocked we were even though we’d been preparing for it for a long time and even praying for it. I guess you never can be fully prepared. Bill’s mother is not doing well. She is physically frail to begin with and had just gotten out of the hospital after a bad fall. She was brought up in a generation that seemed to make women feel guilty about everything. For some strange reason she blames herself for her husband’s death. She also feels that she has lost him twice – once to Alzheimer’s and now to death. It can’t be easy to lose your companion of 59 years. This is the first parent either of us has lost. My father-in-law’s relationship with his entire family has always been a little dysfunctional. Without going into private details, he was a very narcissistic man who only thought of his own wants and needs. But he did manage to raise (with a great deal of influence from their mother) some very fine children, including a son (my husband) who is one of the nicest people you could ever meet. One of the other daughters-in-law said that she had recently read an article that said there are four things you must say in order to come to terms with a loved one’s death. “I love you, I forgive you, forgive me, and goodbye.” Even if the words are not said before death, there is a great deal of healing in saying them after. On a happier note, I am off to Seattle for the weekend. I was going to cancel, but my husband insists that I go. My sister and I have had this weekend planned for a long time and he has plenty to keep him busy. In fact, he will drop me off at my sister’s and then continue on to SeaTac Airport to pick up his sister who is flying in today. For Christmas my sister gave me tickets to “The Lion King”. Everyone who has gone to it has raved and I’m very excited. I’m also going to take my gift certificate that my parents gave me to the little yarn shop around the corner from my sister’s house. Plans right now are to buy the yarn for Rogue, but those plans could change once I start fondling all that beautiful yarn. So I’m going with an open mind. Next week will be a busy one with family, services, work and school, so I will probably not get around to posting for at least a week. Great progress has been made on the shawl (much better than I anticipated), so who knows! Maybe a surprise? I figure that at a minimum of 20 repeats a week (just guessing), and 4 stitches of the shawl being eaten up with each repeat, it will take me approximately . . . . gasp!! That can’t possibly be right!!! 32.7 weeks? Some math wizard please tell me that can’t be right. That’s almost eight months. Well, I’ll either have to develop a lot of patience or increase the number of repeats I can accomplish each week – 20 was only a wild guess. But I can’t just work on this or I will go mad. Mad, you hear me, mad!! So we will just have to see. Despite dire predictions to the contrary, we didn’t get any snow at all other than a really light dusting this morning. I was quite disappointed. We had plenty of groceries, plenty of yarn, no committments for the weekend and I was ready to be snowed in. Now that a week full of work and meetings commences, we’ll probably get snowed in for sure. Hmmm – I wonder how many repeats I could get done? Mad, you hear me, Mad!!!!!! 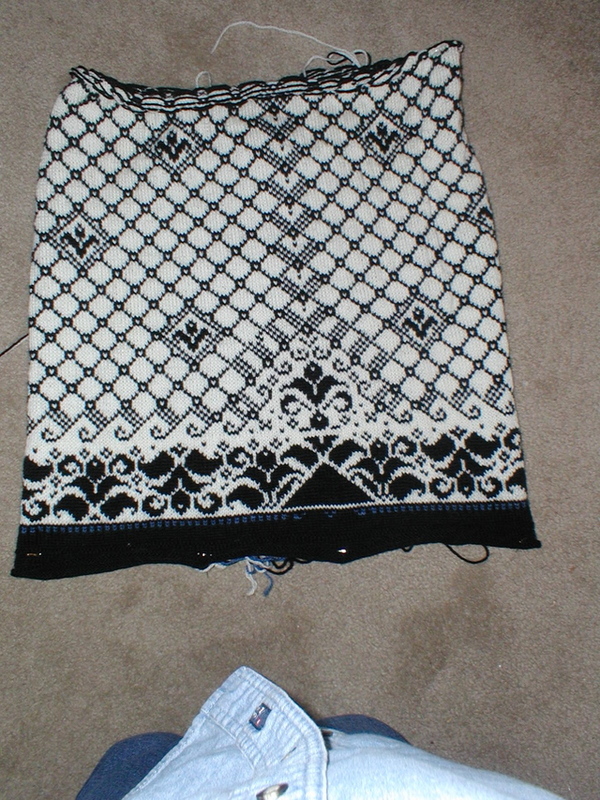 Addendum: I redid my math – if each point eats up 4 shawl stitches and I do 20 points a week, that’s 80 shawl stitches. 1308 total divided by 80 equals 16 weeks. Much better! AAAGH!! My eyes, they are a-burning! I was such a good girl today and forced myself to go to the library to take a proctored Sociology exam. It was hard!! But I was prepared and think I did well. There were 60 multiple choice questions worth one point each and two essay questions worth 20 points each. I love essay questions. My theory is if you can’t impress them with facts, you can baffle them with bulls**t. And I’m good at that! Actually one of the essay questions was about a study by McClanahan and Sandefur on single parents and that was one area I studied extensively, so I nailed it. This is a Sociology class that overlaps from last semester. All I have left on it now are two nine page papers and the final exam (did I say that’s all?). My other classes start Monday and I will be taking the Sociology of Aging and a class on Child Abuse. The great news is that by the end of this semester I will officially be a SENIOR!!! WHOO HOO!! Anyway, that’s not the only reason my eyes are burning. To reward myself for taking the test and for deep cleaning the kitchen, I pulled out the Mediterranean Shawl. Yes, that really was a reward. 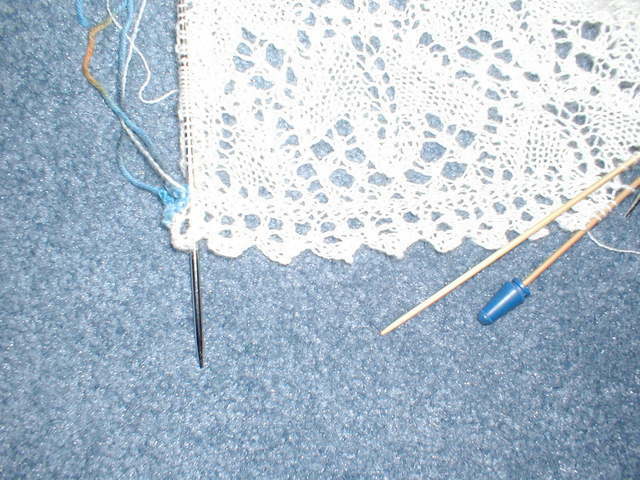 I am so anxious to knit some lace again. I have finally finished all the ripping out and am now picking up stitches around the outside edge (again!). 271 stitches down and 1036 to go. Yes, really! And this was a reward? 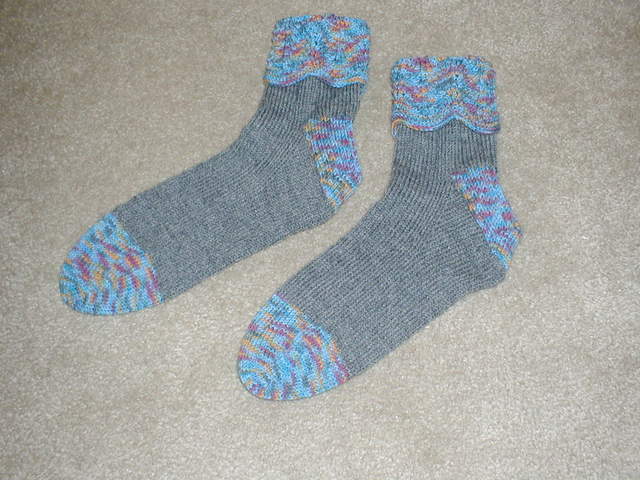 And the first FO of 2005 – my Old Shale Two socks with the not-EOP-heel. The color is a tad washed out, but ain’t they purty? They fit well too. I have a feeling they are going to be favorites. And I will definitely make them again. In fact, I think a pair will end up under the Christmas tree next year for some lucky recipient (but not this pair!). Thanks Marguerite! And, I did some housekeeping on my sidebar. There are two new buttons. One is for Susan’s Hugs and Kisses Socks. 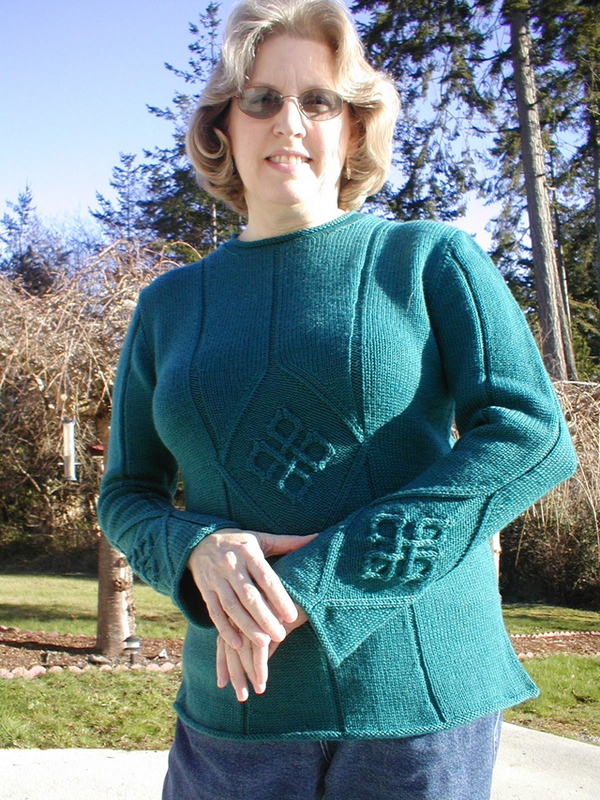 She is donating all the proceeds to tsunami relief, so hop on over and purchase the pattern. I think these will definitely be my next pair of socks. And Brenda has started a blog with some great quick recipes. Check ’em out. Heavy sigh – now back to picking up stitches! When putting up the Christmas decorations I found the box containing my son’s baby clothes. 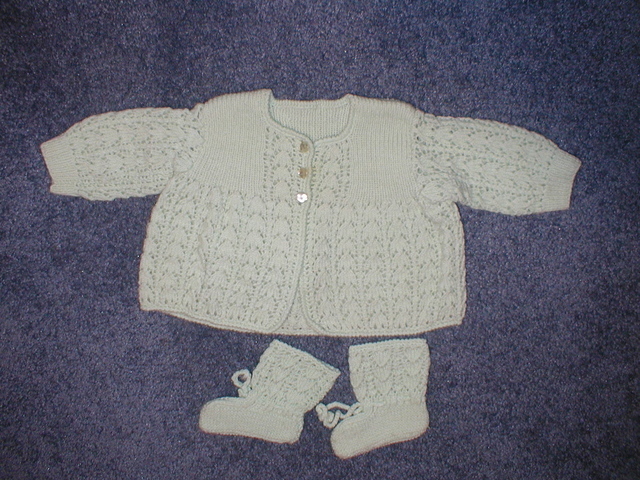 In the box was a sweater that I knit for him before he was born, along with various knitted items I made for him when he was little. I’ll post some pictures later in the week. It will be so much fun seeing his child wearing them! I just viewed my site and the first two pictures are really awful, but they’re the best I could get. The one of the sleeve is pretty accurate. Maybe if we’re blessed with sun tomorrow I’ll be able to get better ones.